Christmas is right around the corner and, if you are like me, you are probably thinking about gift ideas for your family and friends. However, if you are like Andrew, you’ll probably wait until the week of. 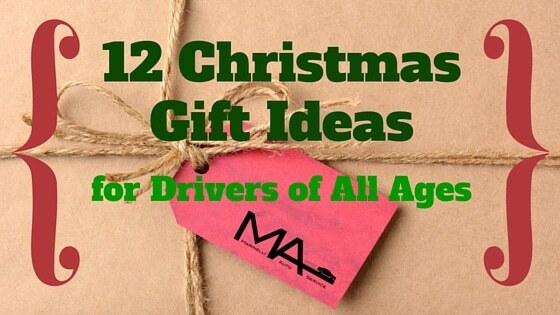 Whichever your shopping style, I thought I’d give you a head start on some gift ideas. We can’t leave out our young friends who love cars but have some growing to do before they can reach the pedals. Andrew loved his toy cars when he was a kid and I have to admit, playing cars with my brother when I was younger was pretty fun. It’s a timeless toy that will light up any child’s face on Christmas morning. Ok, I know. It sounds so simple and maybe even a little boring but bear with me. On our 16th birthdays, my parents gave each of my siblings and I a meaningful key chain. Since my family was into sailing, we each got a nautical themed key chain. I still have my ship’s bell key chain 16 years later because it was a meaningful gift and reminds me of special times I spent with my family. More than just style, sunglasses can keep the new driver in your life safe on the road. I always have a pair in my purse because my eyes are super sensitive and I simply don’t feel safe driving without them. Even for your average person, especially if you live in the sunshine state like we do, being distracted by glaring or squinting can be dangerous while driving…and being stylish in some killer shades is just an added bonus. I love coffee and tea! It’s a pleasure to be able to grab a cup on the way out the door whether your loved one is heading to class, work, or wherever. A fun travel mug that reflects their personality will be sure to put a smile on their face on Christmas day. I, personally, have been resisting the smartphone era pretty much since it began. However, I realize my case is not the usual and that there are great benefits to having a smartphone. For example, there are some really cool apps out there, including ones that help keep track of fuel economy, maintenance schedules*, and repair logs for your vehicle. These apps are available for both iPhones and Android phones. *It is important that maintenance schedules are used in accordance with the manufacturer’s maintenance schedule for your vehicle and the advice of a trusted, competent mechanic. Fellow Floridians (or anyone who lives in a warm climate) know the great discomfort of getting into your car at the end of a hot summer day, then cranking the AC up as high as possible while waiting for the steering wheel to cool off enough to touch it without scorching your hands. Ouch! Windshield sunshades and steering wheel covers are a huge blessing on days like this (which is most days in Florida)! After spilling an entire pot full of soup all over my car when I took a corner just a little too fast on the way to a group dinner, I went out and purchased rubber floor mats. Even the professional detailing job didn’t completely get the french onion smell out of my car! I then bought a set for Andrew after we got married. Rubber floor mats aren’t too expensive and yet they are great for keeping a car cleaner for longer. Help the new car owner in your life feel safe on the road. You never know when something could go wrong. What better way can you show your loved one how much you care about them than by thinking about their safety? For some ideas of items to include in your kit, the Department of Motor Vehicles shares a comprehensive list. Andrew showed me a few episodes of Top Gear when we were dating and I’ve been hooked ever since. I never dreamed of enjoying a gear head TV show but this is more than just men talking about and driving fast cars. They have all types of crazy competitions that will leave you rolling on the ground laughing as well as interesting international road trip specials. Being from the Great Lakes State, my favorite episodes involve amphibious car challenges. We prefer the British BBC version. Please be aware that this show is not always family friendly – there is occasional language and inappropriate comments. For someone who likes taking long road trips, a quality GPS is a must. Andrew and I have taken the 24 hour straight road trip from Orlando, Florida to see my family in Michigan a couple of times and we were so grateful for our GPS. If your loved one uses a GPS smartphone app, a dash-mounted phone holder may be just the thing. Research great racing events near where your loved one lives. Going to the races could be a great guys’ day out, a fun date, or even a family outing. I am not an avid video game person, but given the opportunity to play a racing game you will see my competitive side come out. Racing games are available in a huge variety from arcade-style fun to ultra-realistic simulations. For those who want an even more realistic experience, there are also steering wheel and pedal controllers available. Gifts aside, the holidays are a time to spend time with the people you care about most. We hope you have safety in traveling to see friends and family, a Merry Christmas and a Happy New Year!